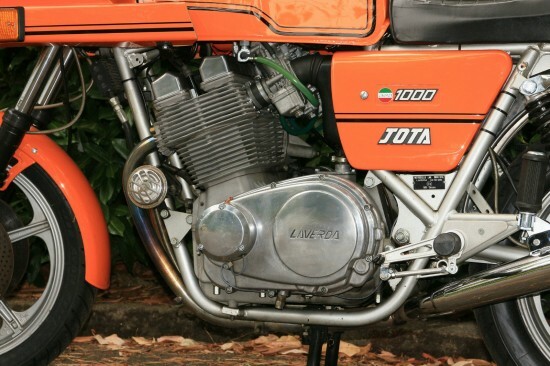 The original Jota was created, not by the Laverda factory in Breganze, Italy, but by Slater Laverda, a dealer and shop in England. Introduced in 1976, it was basically a high-performance version of the company’s 3CL 1000 with a much more evocative name. Upgrades generally included high-compression pistons, camshafts, and a free-flowing exhaust although Jotas were, in the typical Italian style, subject to different specifications, depending on when and for what market they were built. It wasn’t a true factory model, so details varied from country to country and year to year, although US models are generally understood to be of lower-spec than the original British bikes. Changes to the 981cc three-cylinder engine were good for 90hp and 146mph. Early bikes featured a 180° camshaft that had the outside pistons rising and falling together. 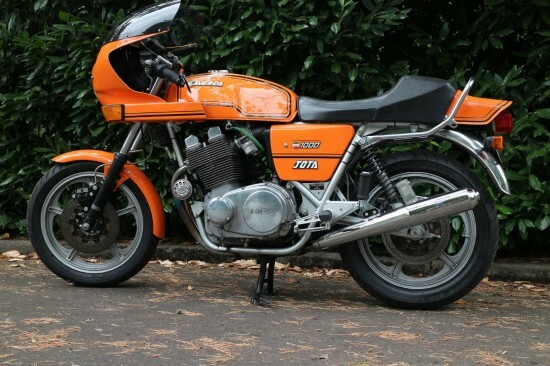 Supposedly better for power, and certainly good for noise: the Italian triple was raw and raucous, and sounded like a four with a miss… In 1982, Laverda switched to a smoother 120° camshaft, although having heard those a few times in person, they’re far from tame. Jotas are brutal bikes: tall, with heavy controls, although the famous adjustable bars at least make finding a comfortable riding position a bit easier. The flip side is that they’re also ruggedly overbuilt and while, like all older machines, they do require more tinkering than a modern motorcycle, the hard parts are extremely robust and the bikes can cover huge miles before needing significant work. 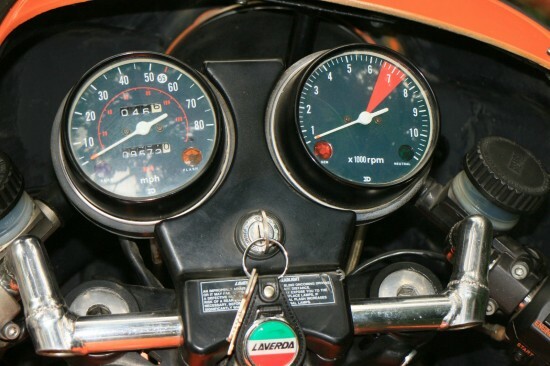 This is a 1982 Laverda Jota 180 which has just finished a restoration after being in long term climate controlled storage. It is number 8118 making it one of the last ones built. Everything that needed to be replaced was replaced – details of the items are below. This is as close to an original bike as can be found in North America. The bike is ready to ride – I’ve put just a few hundred miles on it since restoration, to test all systems and performance, and is ready to go to someone who will love and use her. Restoration did not include any engine work; seals etc but there are no leaks. This bike has ~9500 miles on it, with more being added. 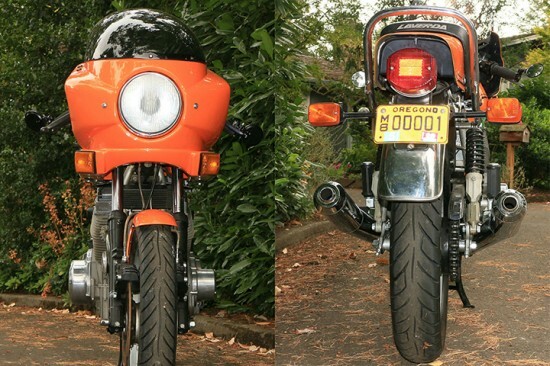 This bike had never been taken apart, it had damage to the fairing during storage, caused by falling wood, which was repaired and the entire bike was repainted by a professional painter. The tail piece was broken and replaced with a carbon fiber unit. The stripes on the tail piece reveal the carbon fiber. A new dark windscreen was installed. When adjusting valves the internals looked brand new! This is a US Spec bike, all in fantastic original condition. Please look at the photos, original finish on engine and frame, was in great condition when I acquired the bike. I went through and rebuilt all the hydraulics and carbs with new parts. I replaced the original Ignition and pickups with an Ignitech controller and electronic sensor board as the original pickup wires had deteriorated. I repaired the original pickup wiring and they will be included. The listing also includes additional work that has recently been done to the bike. Although this one is listed as a 1982, the seller mentions it has the earlier 180° so it’s technically a leftover 1981 model, making it far more desirable than the later versions. Interestingly, these make peak power at 7,500 rpm, north of the indicated redline on the suspiciously Honda-looking tach, making the red band actually more of a “power band”. Bidding is very active, as you’d expect, although at just north of $11,000 the reserve hasn’t been met yet. That’s no real surprise: this looks to be a great example of the last of the fire-breathing Jotas, and should go for a good bit more than that. While I’m not the biggest fan of the huge fairings often found on these, my fantasy garage absolutely includes a three-cylinder Laverda. 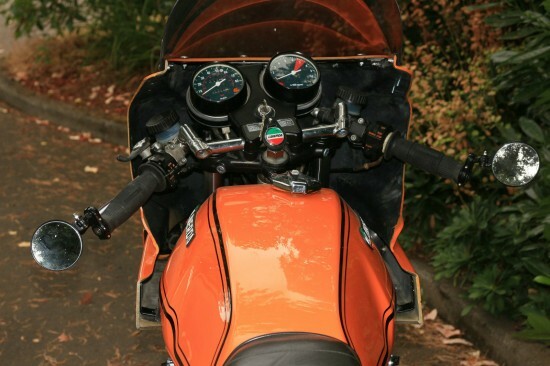 In bright, Laverda orange. Tad, remove the fairing and display it on your living room wall. Voila, a naked Jota and your golden. Hello bug splats on your face shield. 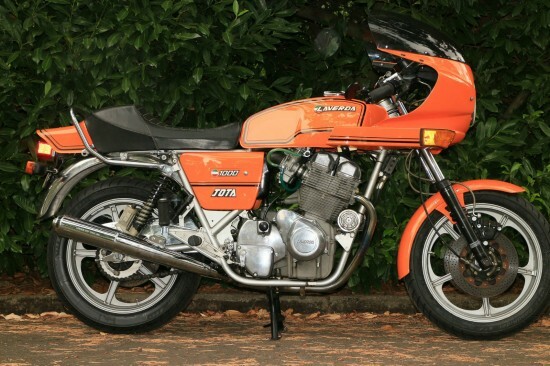 I could really use a $45K cash infusion right now to pick up this Jota, that beautiful Rickman-Triumph, and a sweet ’70 Kawasaki A-7 Avenger also for sale on ebay. I’ll gladly welcome any donations towards my dream garage fund. THAT is an excellent idea! Bet it would look pretty cool as a huge lampshade, or something… And when you figure out where there’s $45k lying around for the asking, please let me know: I need a piece of that as well!